Kessentini, H.; Lehmkuhl, O.; Capdevila, R.; Castro, J.; Oliva, A. Flat plate solar collector with plastic transparent insulation materials and ventilation channel as overheating protection system inserted between the absorber and the back insulation has been studied numerically. First, a general object-oriented unsteady model of this solar collector is developed and presented. It allows solving, in parallel way, every component separately and interacting with its neighbors to set the boundary conditions in every time step of the simulation. Every component can be simulated using its own mesh and the number of CPUs necessary (depending on the simulation level needed). Second, the numerical simulations of the fluid flow and heat transfer by natural convection in the bottom part (ventilation channel) and the upper part (air gap + TIM) of the collector are done separately. The simulation has taken into account the different operation modes of the channel (opened at high operation temperatures and closed in normal operations). A three dimensional parallel turbulent CFD model based on Large Eddy Simulation is used in the simulations. The obtained numerical results are validated with experimental and benchmark results found in the literature. Kessentini, H. [et al.]. 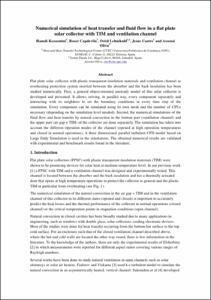 Numerical simulation of heat transfer and fluid flow in a flat plate solar collector with TIM and ventilation channel. A: ISES Europe Solar Conference. "Solar energy for a brighter future: book of proceedings: EuroSun 2012". Rijeka: 2012.